One of the leading giant in electronics industry better known for it’s new innovatory quality products across the world is in the news once again as the company has revealed the they are working on tablet which will be controlled by human brain. Samsung is on it’s way to introduces a mind control function into it’s gadgets which will enable the user to check it’s e-mail or call a friend without even touching the screen or even speaking to a disembodied helper. The ultimate goal of the project, say researchers in the company’s Emerging Technology Lab, is to broaden the ways in which all people can interact with devices. 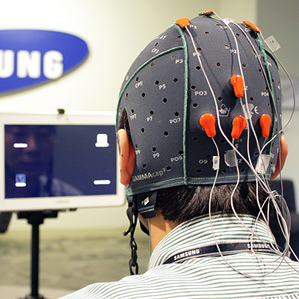 To use EEG-detected brain signals to control a smartphone, the Samsung and UT Dallas researchers monitors well-known brain activity patterns that occur when people are shown repetitive visual patterns. In their demonstration, the researchers found that people could launch an application and make selections within it by concentrating on an icon that was blinking at a distinctive frequency. Now you all must be thinking that what is this EEG and how it works? So here is the answer, basically, a electroencephalogram (EEG) is a test that measures and records the electrical activity of your brain. Special sensors (electrodes camera) are attached to your head and hooked by wires to a computer. The computer records your brain’s electrical activity on the screen or on paper as wavy lines. Certain conditions, such as seizures, can be seen by the changes in the normal pattern of the brain’s electrical activity. Insoo Kim is one of Samsung’s lead researchers on the programme and he believes it is all about finding new ways to interact with devices. “Several years ago, a small keypad was the only input modality to control the phone, but nowadays the user can use voice, touch, gesture, and eye movement to control and interact with mobile devices. Adding more input modalities will provide us with more convenient and richer ways of interacting with mobile devices,” he said. From the Sources, we came to know that Samsung is on it’s way to build this project in collaboration with Roozbeh Jafari, an assistant professor of electrical engineering at the University of Texas, Dallas, Samsung researchers are testing how people can use their thoughts to launch an application, select a contact, select a song from a playlist, or power up or down a Samsung Galaxy Note 10.1. While Samsung has no immediate plans to offer a brain-controlled phone, the early-stage research, which involves a cap studded with EEG-monitoring electrodes, shows how a brain-computer interface could help people with mobility issues complete tasks that would otherwise be impossible. It seems pretty exciting feature let’s hope Samsung Human Mind project end with success.